This update has been prepared by International Partnership for Human Rights (IPHR) and the Legal Prosperity Foundation (LPF) in cooperation with the CIVICUS Monitor. It covers developments on freedom of expression, association and assembly in Kyrgyzstan between December 2017 and February 2018. During this period, former President Almazbek Atambayev continued to insist on the execution of court rulings ordering an independent media outlet and its co-defendants to pay huge amounts in compensation for coverage deemed defamatory of him. He stepped back, however, from a demand to auction off the apartment of one of the convicted journalists after it was proven that this is the journalist’s only dwelling, which he shares with his elderly mother and sister. In a positive move, newly-elected President Sooronbay Jeenbekov dropped a claim for compensation against a media outlet convicted of defaming him. While this was a welcome step, Jeenbekov failed to withdraw another claim against a journalist who was convicted over the same article. A criminal case opened against a journalist because of her investigative reporting on corruption sparked new concerns over restrictions on free speech, as did actions taken in relation to TV stations affiliated with government opponents. The court decision to ban one such station was upheld on appeal, while another was subject to a court order to seize its property. The government also announced that it was elaborating draft legislation on social media, sparking fears that new limitations on such media may follow. An earlier court ruling in favour of a human rights NGO in relation to the national security services was overturned on appeal, and an initiative by the same organisation to hold a peaceful march in support of women’s rights was cut short by local authorities who only gave the green light for a gathering in one location without the march. Other peaceful assemblies, however, did take place without interference. These and other recent developments are described in more detail below. The last update by IPHR and LPF reported a Supreme Court ruling from November 2017 that upheld lower-level court decisions on a series of defamation lawsuits initiated by the General Prosecutor against the independent Zanoza news site and its co-defendants. This legal action relates to articles deemed offensive of former President Atambayev. The news outlet, its co-founders – Narynbek Idinov and Dina Maslova – as well as human rights defender, Cholpon Djakupova, and lawyers from the Ata Meken opposition party who were quoted in the articles in question, were ordered to pay compensation to the ex-president totaling several hundred thousand euros. The individuals implicated in these cases were banned by the court from leaving the country and Idinov’s and Djakupova’s real estate property (one third of an apartment and a holiday cottage, respectively) were subject to seizure until the required compensation was paid. In January 2018, Atambayev’s legal representative filed a request with the court to order the sale of Idinov’s and Djakupova’s property as a way of securing funds to pay the compensation. On 14th February 2018, a district court in Bishkek approved the request to put up Djakupova’s holiday cottage for sale. However, on 22nd February the former president’s representative withdrew the request with respect to Idinov’s property after the journalist presented documentation showing that the apartment in question is his only place of residence, which he shares with his 90-year-old mother and sister. The journalist will nevertheless still need to pay the court-ordered compensation, amounting to nine million Kyrgyz som (over 100,000 EUR). In a joint appeal sent to members of parliament, representatives of 22 NGOs expressed concerns that the court decisions issued in the defamation cases involving the ex-president were disproportionate, unreasonable and unjust since the defendants were ordered to pay large amounts of compensation that they clearly do not have the means to pay. The signatories also stressed that these decisions create a problematic precedent for other cases. They urged the parliament to take action within its powers to address this issue. In another case from October 2017, which was also covered before, a Bishkek district court ordered the 24.kg news portal and journalist Kabay Karabekov to pay about 60,000 EUR each in compensation to current President Sooronbay Jeenbekov because of an article considered defamatory of him. This article discussed prospects of the Russian government’s cooperation with Jeenbekov and factors that may influence this cooperation, including alleged ties between Jeenbekov’s family and organisations deemed “extremist” in Russia. At the beginning of February 2018, Jeenbekov dropped his request for moral compensation in relation to 24.kg after the news portal published a rebuttal and apology. The Ombudsman and civil society representatives welcomed this step and expressed hope that others would follow his example. However, the new president did not withdraw his claim for compensation against journalist Kabay Karabekov. The journalist told media that he has already received an order from court bailiffs to pay the compensation and that he has been banned from leaving the country until it is paid. Similar to the defendants in the defamation cases involving the ex-president, Karabekov may face criminal charges if he fails to pay the moral damages. On 22 February 2018, the Supreme Court upheld the ruling against Karabekov. In December 2017, the State Service for the Fight against Economic Crimes opened a criminal case on the alleged disclosure of confidential bank information in two articles authored by journalist Elle Alkanova. These articles, which were published on the regional Fergana News site, discussed the privatisation of elite cottages outside Bishkek and drew attention to irregularities in this controversial deal and the possible involvement of people close to the prime minister. Her conclusions in this respect were based on documents she had obtained from the BTA Bank. Alkanova was summoned for questioning by police and prohibited from leaving the country during the investigation. On 13th February 2018, she was charged with unlawfully receiving and disclosing information constituting a commercial or bank secret, for which she could be sentenced to up to ten years in prison. The international Committee to Protect Journalists condemned the charges against the journalist, asserting that they were brought “in retaliation for her investigative reports” and called on the Kyrgyzstani authorities to drop them. Alkanova has written for Radio Free Europe/Radio Liberty and Kloop, in addition to Fergana News, and has contributed to the international Organized Crime and Corruption Reporting Project. As covered before, another independent journalist, Ulugbek Babakulov, is under investigation on charges of “inciting inter-ethnic hatred”. The criminal case against him was opened in summer 2017 after he publicised aggressive nationalism against ethnic Uzbeks on social media. He subsequently fled the country, fearing politically-motivated prosecution. On 27th December 2017, the Supreme Court rejected an appeal filed by the September TV company regarding a court decision from August that banned the TV station’s activities. As reported before, the widely-criticised court ruling found that an interview aired by September TV was “extremist” since the interviewee accused president-elect Jeenbekov and his brother of misappropriating government funds in connection with the June 2010 inter-ethnic violence in southern Kyrgyzstan. The decision of the Supreme Court is final and cannot be further appealed. The September TV station is affiliated with Ata-Meken Party leader, Omurbek Tekebayev, a former Atambayev ally who was imprisoned in August 2017 on charges his supporters consider politically motivated. In another development that gave rise to concerns about undue interference with the media, a local court ordered the seizure of the property of NTS, Kyrgyzstan’s largest private TV station. On 19th December 2017, court officers and police arrived at the TV station’s offices to present the court order, which was issued the same day in response to a request from an offshore company. NTS is associated with Omurbek Babanov, Jeenbekov’s main rival in the October 2017 presidential elections. NTS denounced the move against it, and Babanov called it “inconceivable” and accused the authorities of using “raid methods” and “exploiting the court” to pursue the TV station. Court marshals subsequently made an inventory of the station’s property, but the TV station was able to continue its operations. NTS announced that it would file an appeal against the court decision. Following the presidential elections, a criminal case was also opened against Omurbek Babanov who is accused of “inciting ethnic hatred” and “calling for the violent overthrow of the government” because of a campaign speech he made in Osh. He currently resides abroad. As covered in the previous update, the authorities deported Chris Rickleton, a British journalist working as Central Asia correspondent for Agence France-Presse when he arrived in Bishkek on 9th December 2017. They did not explain the reasons for the deportation. In an interview with K News in mid-January 2018, Rickleton said that he had received a response from the national security services to his complaint about his deportation and was planning to file an appeal. During a parliamentary debate in January 2018, Deputy Ulan Primov argued that legislation to regulate social media is needed in Kyrgyzstan since there is so much “incorrect, unreliable and defamatory” information on these media. He said that it would be important to look into how social media is regulated in other countries of the Eurasian Economic Union (whose members include Russia, Belarus, Kazakhstan and Armenia, as well as Kyrgyzstan) and called on the government to elaborate draft legislation for submission to the Parliament. In response, Deputy Justice Minister Ravshan Abdullaev said that his ministry is currently working on this issue and that a process of elaborating draft legislation is under way. As of mid-February 2018, the draft legislation was not publicly available. However, in view of the recent deterioration in freedom of expression, civil society is concerned that such draft legislation may introduce new restrictions on internet use, especially if the example of other post-Soviet countries is followed. Draft legislation presented by another parliamentary deputy, Dastan Bekeshev, in late December 2017 also sparked a heated debate, especially on social media where many expressed concerns that it may undermine free speech. The draft legislation is aimed at regulating the format and procedure for publishing retractions with respect to information that has been found defamatory by court. In particular, Bekeshev argued that it is important to ensure that retractions of defamatory information posted online are made widely available on such resources, for a prolonged period of time, and on all sites where the original information was posted or re-posted. In addition, he proposed establishing a minimum level of compensation for moral damages in defamation cases, at 20,000 som (240 EUR). 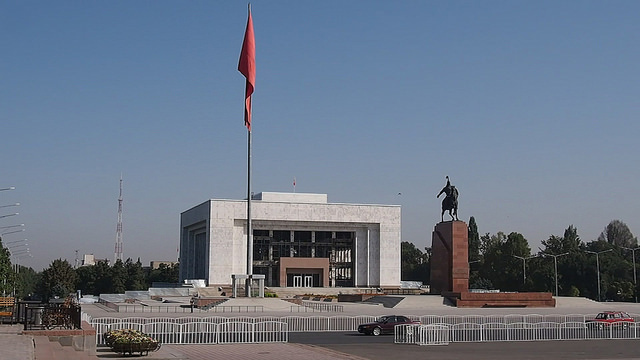 This is a considerable amount for most people in Kyrgyzstan and critics believe that the proposed provision may discourage social media users, for example, from freely expressing their views out of fear of being held accountable for defamation. Bekeshev did not propose establishing any maximum level of compensation for defamation, in spite of the concerns civil society has raised over the excessive amounts recently imposed by courts in defamation cases involving public officials. In the last update, IPHR and LPF reported on a Bishkek district court decision from October 2017 in favour of a lawsuit that the Bir Duino Human Rights Movement had brought against the national security services. The court found that a press release issued by the security services in January 2017 was inaccurate and ordered them to publish a retraction. The press release in question claimed that the NGO had obstructed a law enforcement operation to arrest an individual suspected of extremism in the Osh region. However, the security services appealed the October court ruling and on 25th January 2018, the Bishkek City Court overturned it and rejected Bir Duino’s claims. The human rights NGO expressed disappointment with this new development in the case and announced plans to appeal the decision in the Supreme Court. During the period covered by this update, dozens of peaceful assemblies took place in Kyrgyzstan on issues that were of concern to citizens and/or under broad public discussion. Among others, assembly participants protested against construction projects, voiced concern about a new law on state benefits, commemorated the memory of the victims of a plane crash and rallied in support of opposition members considered to be imprisoned on politically-motivated grounds. The NGO Bir Duino Human Rights Movement informed the Bishkek Mayor’s Office in advance that it would organise a peaceful march in support of women’s rights in the capital on 20th January 2018. The purpose of the event was to draw attention to problems such as child marriages, bridenapping, polygamy, sexual violence and trafficking in women. The march was due to proceed from the monument in honour of Urkuya Saliyeva (a political activist, who among others advocated for the rights of women before being killed during the Soviet era) to the central Ala Too Square. In response, the Mayor’s Office recommended organising an assembly by the above-mentioned monument but without conducting any march, arguing that a march would obstruct traffic (if held on the street) or cause inconvenience to other citizens (if held on the sidewalk). As a result, the NGO had to change its plans to carry out the march and restricted the assembly to a gathering by the Urkuya Saliyeva monument. It has submitted an appeal to court over the local authorities’ decision to restrict the assembly to one place. The actions of the Mayor’s Office in this case were contrary to the state’s obligation to facilitate peaceful assemblies at the organisers’ preferred location and to refrain from routinely imposing restrictions that fundamentally alter such events, as set out in the OSCE Guidelines on Freedom of Peaceful Assembly. Moreover, its actions were of concern in light of the principle of non-discrimination, since other marches, in particular official ones organised by public authorities, have previously been allowed to take place in the capital without restriction. When official assemblies are held, local authorities and police also typically take a range of proactive measures to facilitate these events, including closing off streets and redirecting traffic.